The euro is on fire. In the past 26 days, it rose from a low of 1.05 to a high of 1.09. A lot has changed in the Eurozone over the past month, leading to the currency’s strong outperformance. At the end of last year, the euro fell sharply and this weakness has gone a long way in boosting the economy. We often say that the path to a stronger currency is through a weaker one and this is exactly what is driving Europe’s recovery. Data has been exceptionally healthy with manufacturing and service sector activity in Germany and France, the region’s 2 largest economies growing quickly. The 3 month average PMI composite index which is an important measure of economic activity rose to its highest level in 6 years and this morning German business confidence hit its strongest level since 2011. These improvements have even sparked talk of tightening. While we don’t think the ECB is in any position to raise interest rates in the near future, their level of dovishness is definitely receding. French politics is a problem but Macron’s strong performance over Le Pen at the first debate eased concerns for many. There are a few Eurozone economic reports scheduled for release this week (confidence and German unemployment) and we think they will continue to surprise to the upside, driving euro higher. We like buying euros versus the Australian dollar because there are no major Australian economic reports scheduled for release this week and more importantly, iron ore and copper prices have been falling sharply, leading to underperformance in the currency. 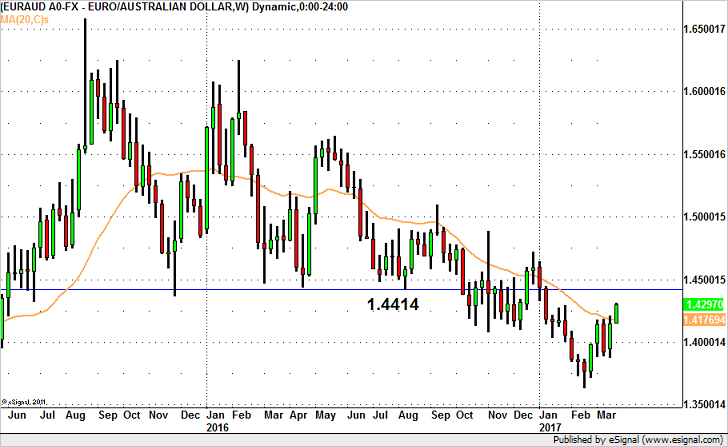 Technically, we’ve just seen a major breakout in EUR/AUD. For the first time in nearly a month, the currency pair has broken above the 20-day SMA and with that move should target the August low of 1.4414.